Histamine is an important biogenic amine, which acts with a group of four G-protein coupled receptors (GPCRs), namely H1 to H4 (H1R – H4R) receptors. The actions of histamine at H4R are related to immunological and inflammatory processes, particularly in pathophysiology of asthma, and H4R ligands having antagonistic properties could be helpful as antiinflammatory agents. 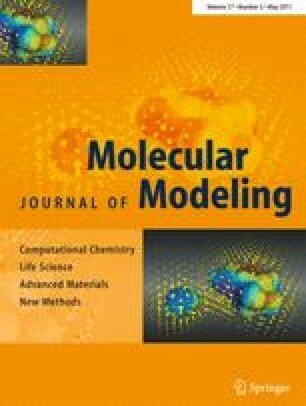 In this work, molecular modeling and QSAR studies of a set of 30 compounds, indole and benzimidazole derivatives, as H4R antagonists were performed. The QSAR models were built and optimized using a genetic algorithm function and partial least squares regression (WOLF 5.5 program). The best QSAR model constructed with training set (N = 25) presented the following statistical measures: r 2 = 0.76, q 2 = 0.62, LOF = 0.15, and LSE = 0.07, and was validated using the LNO and y-randomization techniques. Four of five compounds of test set were well predicted by the selected QSAR model, which presented an external prediction power of 80%. These findings can be quite useful to aid the designing of new anti-H4 compounds with improved biological response.